Dell Children’s Neonatal Intensive Unit (NICU) and Pediatric Intensive Care Unit (PICU) cares for newborns and children who are seriously ill. 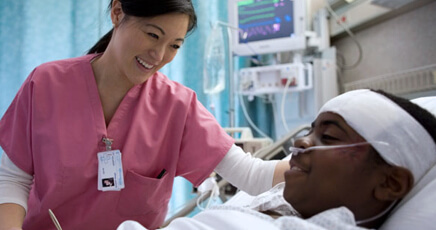 The staff at the ICUs is specially trained for the unique healthcare needs of our critically sick patients. Because the babies in NICU can’t always be held and sung to by their parents, certified music therapist Della Molloy-Daugherty has come up with a way to ensure that our littlest patients always have access to their parents’ voices. Babies come to the NICU for many reasons, but primarily because they need more care than is offered in the regular nursery. At Dell Children’s, our dedicated NICU team is trained to care for very sick babies. Our goal, along with providing quality care, is to provide families with the tools needed to share positive experiences with their baby. Comprised of 30 beds, our Level IV Neonatal Intensive Care Unit offers 24-hour coverage by neonatologists, nurses, surgical specialists, and ancillary staff who work closely with physicians in a variety of specialties to care for the diverse medical needs of our smallest and most fragile patients. The Neonatal Intensive Care Unit has all private rooms that control light and sound to aid in the healing of the newborn. There are also Infant/Parent Bonding Rooms to provide monitored support to help parents prepare for home care. A Level IV Neonatal Intensive Care Unit (NICU) is a special nursery for premature and sick newborns staffed by physicians (neonatologists), nurses and respiratory therapists specially trained to care for critically ill neonates with complex medical and/or surgical needs. We also offer a NICU follow-up program in collaboration with Austin’s First Steps (Pediatrix) and Pediatric Specialty Services (PSS) to ensure optimum health, developmental and functional outcomes for NICU graduates. The Pediatric Intensive Care Unit (PICU) at Dell Children’s is the only critical care facility expressly for children in Central Texas. This 24-bed unit delivers highly-specialized care to children with a host of illnesses and injuries, many of them life-threatening. Experienced teams provide care for kids recovering from severe trauma and motor vehicle crashes, as well as postoperative patients, including those with congenital heart disease, acute abdomen, neurosurgical, urological and orthopedic conditions. Nonsurgical concerns may include acute and chronic illnesses, multi-system failure and respiratory distress. These children may require numerous interventions such as endotracheal intubation, invasive hemodynamic monitoring, in-depth and ongoing assessment, medication and blood administration, respiratory care and enteral/parenteral nutrition. Our teams are specially trained in the latest procedures of pediatric critical care medicine, delivering the most sophisticated medical and surgical care needed for our most critically ill or injured children. Pediatric Critical Care Associates at the Dell Children’s Medical Center of Central Texas is a specialized group of pediatricians dedicated to the care of hospitalized pediatric patients. PCCA serves the Pediatric Intensive Care Unit (PICU) at Dell Children’s – a 24-bed unit and the only critical care facility expressly for children in Central Texas. Our pediatric intensivists, working with a team of subspecialists and nurse practitioners, participate in the care of all patients admitted to the PICU. Emphasis is placed on a multidisciplinary, collaborative approach to care for a diverse and challenging patient population.